Let's look at Nature's systems and their messages .... the B100D system and its social and military expressions VIA human DISPLAY actions. Let's look at some background information about B100D social science messages ....... and then look at the year 1776 hematology / biochemistry military formats..
Combatants: An English and Welsh army against an army of French, Bohemians, Flemings, Germans, Savoyards and Luxemburgers. Generals: King Edward III with his son, the Black Prince, against Philip VI, King of France. Apr 18, 2007 - Description of the Hundred Year's War between England and France. Thus Nature's INTERNAL system conflict and its EXTERNAL conflict display on the geography surface of EARTH .... as explained by Herbert Spencer. Images for 100 y.ar..ds .... the new version ..the new FORMAT of the ancient 100 years war. Comparing the ancient BATTLE to modern football. FOOTBALL and Nature's system ---> SYMBOL MACHINE atomic English language mappings and codes --> that map to REALITY displays on the geography LAND surface of Earth. atomic number 26 of ferrous oxide iron atom ---> hence, the GRID IRON of football sports game. Hemoglobin is a protein carried by the red blood cells that contains iron. A team's offense is given four downs (plays) to move ten yards toward the ... Distance is the number of yards a team needs to get a new set of four downs. 3 days ago - A distinguished guest attends practice and is introduced to the team, and walk-on receiver Austin Daich enters the scout-team spotlight. 17 hours ago - The Arkansas football team's assistant coaches met with the media Sunday to discuss preparation for South Carolina. Date: 26th August 1346 ---> AUGUST --> AUG with human football players as DNA nucleotide display agents. A team's offense is given four downs (plays) to move the brain symbol thoughts of the 4 DNA nucleotides inside the brain SYMBOL bio-computer of 4-H Clubs members in the farm/agriculture community.. In sport, a huddle is an action of a team gathering together, usually in a tight circle, to strategise, motivate or celebrate. It is a popular strategy for keeping opponents insulated from sensitive information, and acts as a form of insulation when the level of noise in the venue is such that normal on-field communication is difficult. Commonly the leader of the huddle is the team captain and it is the captain who will try to inspire his fellow team members to achieve success. Similarly after an event a huddle may take place to congratulate one another for the teams success, or to commiserate a defeat. The term "huddle" can be used as a verb as in "huddling up". 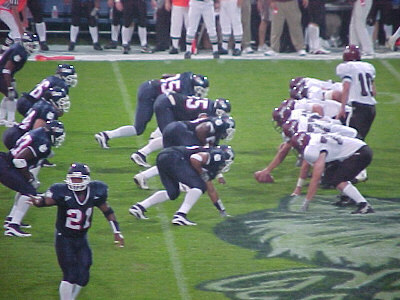 The huddle is commonly used in American football and Canadian football to strategise before each play; the offensive team's huddle is almost always led by the quarterback, and the defensive huddle is typically led by one of the linebackers. It is also popular in basketball, football and cricket. Thus we se see that football and other sports ....... are strange and secret message systems of B100D and biochemistry. Thus we have ACTIVITIES and EVENTS ... that provide b100d LANGUAGE and bl00d social policy infomation ....... an ERROR database for hematology social science and language engineers / analysts. B100d symbol evolution .... b100d levels of knowledge .. can be described with the b100d number 100. Let's look at Nature's most advanced B100D formats. Current theory and data states that B100D is alpha/numeric as described by the atomic English language biochemistry WORD: B100D. B100D ---> B 4 D North America --> Base 4 DNA ...... Nature's INTELLECT and its expression methods. The above B100D table for binary humans ...those with 2-legs, 2-arms, and 2-ears and 4-DNA nucleotides in biochemistry. B100D --> Decimal 100 ---> thus 10 fingers multiply 10 toes = decimal 100. B100D --> hexadecimal Base 16 Hex'100" --> 256 Decimal. A curse (also called a jinx, hex or execration) is any expressed wish that some ... comprise a significant proportion of the study of both folk religion and folklore. Thus we see the various LEVELs of blood and the Hierarchy Problem of physics b100d expressions. Combatants: 2 teams ...... An English language army and Welsh (default) army against an army of ........ and Luxemburgers = Lu x = Logical Unit x bio-computers. Gene Gentics General : King Edward --> Ed + WaR + rd --> education WAR Research Develeopment ..... school shootings at Virgina TECH, Northern Illinois, etc. Thus we have some pieces to a puzzle from Nature .... that involve the OLD version of the 100 years war and the NEW version of the 100 yards football DATA FIELD. In American and Canadian football, a line of scrimmage is an imaginary transverse line (across the width of the football field) beyond which a team cannot cross ..
an imaginary transverse line (across the width of the football field) beyond which a team cannot cross .. Thus we see ..that football fans and the football industry ought study the history behind football ..... and stop their biochemistry manipulations and social engineering schemes. The gene expression WAR of T cell receptors VERSUS unnatural alien Television & Cell phone receptors.